Solar photovoltaic panels on sale in the remote village of Zantiebougou, Mali. In sub-Saharan Africa, where more than 600 million people still lack access to electricity, off-grid renewable power is seen as one of the fastest ways to get energy where it's needed, particularly to remote and rural areas where many Africans live. In power-hungry Goma, in the east of the Democratic Republic of Congo, for instance, "we've had very significant challenges finding very capable talent, particularly at the senior management level," said Kweku Yankson, head of human resources in Africa for BBOXX, a clean energy company working to expand off-grid systems in 12 countries from Rwanda to Pakistan. Rwanda, in turn, has what Yankson described as a big pool of job-ready young talent - but still relatively few people trained in clean energy technology, Yankson said. The effort, led by Power for All - an organisation that promotes more use of decentralised power - and backed by the Schneider Electric Foundation and The Rockefeller Foundation, will focus on building skills in countries where electricity access is very low, said Gilles Vermot Desroches, director of sustainable development at Schneider. The country aims to train a total of 50,000 installers by 2022, according to India's government. Also, even in countries such as Rwanda, where a growing number of multinational companies have trained large numbers of young workers, "the most pressing challenge has been around finding very capable and experienced managing directors and finding senior finance managers," he said. "The main limitation we've faced in Kenya has been the cost of talent," he said. "The program seeks strong university graduates that are put through a rigorous, year-long development and exposure program at BBOXX," Nzirabatinya said. She said she believes the training, "will help me increase my analytical, project management and general management skills" - and give BBOXX a larger potential pool of talent to hire. "I am now working on real projects impacting the lives of thousands of rural households across Africa," she said. Kenya in December launched a new national electrification strategy that includes stand-alone, off-grid renewable energy systems as a key part of the country's goal of achieving 100 percent access to electricity by 2022. 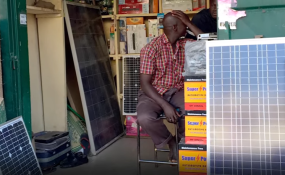 Part of Kenya's push is an off-grid solar access project that aims to connect 1.3 million people in 14 particularly under-served counties, said Isaac Kiva, secretary of renewable energy in Kenya's Ministry of Energy. "We are also now working with our education system to develop solar-specific curricula in order to build the necessary capacity," he said. "This will have a positive impact on the job readiness of the talent pool in Rwanda," he predicted.